JLG Industries NSW have recently announced design upgrades to the JLG LiftPod FS80 model, which boast a range of features making it faster and easier to use. An already revolutionary and award-winning design, the LiftPod is the first portable aerial work platform designed to replace the ladder. The new FS80 model features a bigger work tray that is easier to fit and use, and that attaches to the basket to keep tools and materials within reach of the user. "The improvements in the new JLG LIftPod model have been undertaken with the user very much in mind," says Bob Mules, JLG Industries general manager for Australia and New Zealand. "Everything we do is focused on providing greater convenience and flexibility for the user while making the LiftPod more durable," adds Mules. 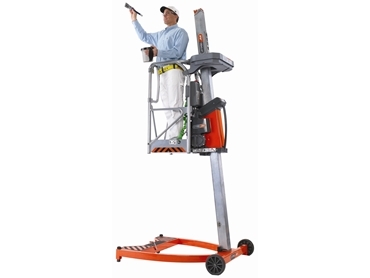 Operated using a 28-volt power pack or an 18-volt cordless drill, the new LiftPod FS80 portable aerial work platform is 10% faster than the previous model, and also boasts 15% more up/down cycles to help enhance productivity. Furthermore, it is also far quieter than the previous model. The gearbox has been improved to enhance performance and efficiency, which allows more cycles per battery charge. A lightweight and mobile model, the LiftPod FS80 aerial work platform can be transported by one person on the back of a utility vehicle. The portability of the work platform is due to the combination of a high-strength steel base with a lightweight aluminum mast and platform. The LiftPod FS80 platform contains an entrance gate and a platform railing system, which provides the user with more opportunities to work with two hands for greater productivity. The LiftPod FS80 aerial work platform reaches a 4.4m working height and is 25% the cost and weight of traditional work platforms, making it ideal for a number of maintenance and repair jobs in almost any building type.